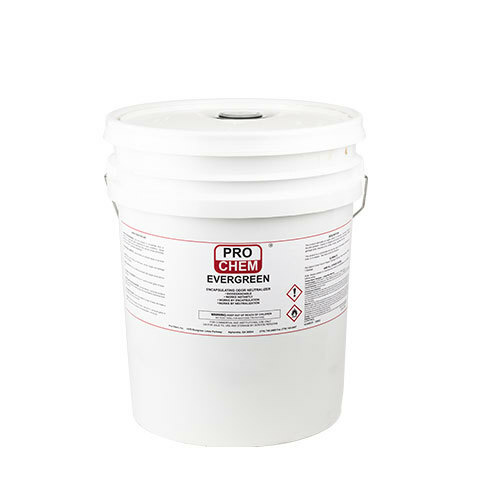 EVERGREEN | Pro Chem, Inc.
Loaded with quality ingredients, EVERGREEN is very effective as an odor control agent for a broad spectrum of malodors, instantly soluble in hot or cold water. It rapidly penetrates the source of malodors by a three way action: 1) deactivates the source, 2) neutralizes the malodor and 3) leaves a fresh, pleasant spearmint fragrance. Biodegradable and phosphate free. Use for odors caused by pets, food, smoke, garbage, sewage and other hard-to-penetrate smells. Use this product in concentrate form or dilute up to 1 ounce per gallon depending on odor conditions. Spray directly onto surfaces such as bathroom tiles, around urinals and toilets or inside surfaces of garbage receptacles. A few drops in a pan of water will create a long-lasting, fresh environment.